Pediocactus is a genus of cacti that include some of the smallest cacti in the United States, growing mostly in north Arizona and Utah. Eight of the nine species are rare and most occur in very localized areas, sometimes of just a few square miles. Pediocatus simpsonii is the most widespread and extremely cold hardy. The genus name comes from Greek “pedion”, meaning “plain”, after the Great Plains of the United States where the plants are found. Species of this genus are referred to as Hedgehog Cacti, though that name is also applied to plants from the genera Echinocereus. and Echinopsis. They may also be referred to as Pincushion Cacti, a common name which is also applied to other genera. These plants are often the prize of collectors who can grow them as they typically prove challenging in cultivation, often grafted. The species are usually solitary, small, up to 3.2 inches (8 cm) tall, globose plants with tubercles and small spines. The spines vary and may be dense or almost non-existent. The flowers arise from the top of the stem and may be pink, white or yellow. Fruit is somewhat fleshy, drying with age and dehiscent. 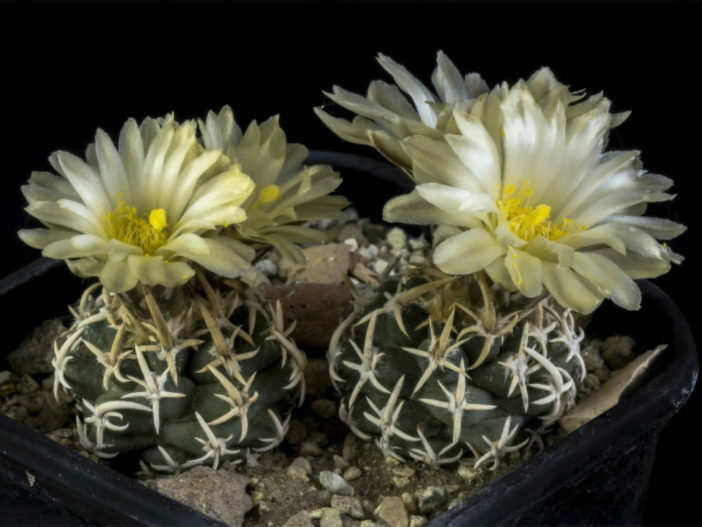 Pediocactus are difficult to grow on their own roots and are cultivated only by skilled and experienced cactus growers. The growing medium needs to be porous so it can drain well and dry out completely. It does best in partial shade and it need protection from the sun during the hottest part of the summer. They don’t like high temperature and humidity levels in greenhouses. This cacti should be placed in a well-ventilated position. They like “wind”. Water them moderately from spring to fall and let dry out between waterings. The rest of the year keep them in dormancy. These cacti are very slow growers. For this reason they are frequently grafted on strong, hardy, cactus stocks like Opuntia and Echinocereus. The flowers buds stay dormant on the plant apex all winter. They will open in spring when the temperatures rise. To avoid any damage to flower buds, the grafted plants should not be let to completely dry out. Some light watering in winter is useful for keeping the flowers hydrated and healthy. It can be propagated from seeds. Pediocactus seeds can take several years to germinate. Seedlings do not grow well either, and some of them die. For this reason plants are frequently grafted.